An estimated 55% of online shopping trips begin at Amazon, and 44% of them end with a sale. Learning to tame the giant that is Amazon is key to Ecommerce success not only in 2018 but going forward. Amazon holds a deep knowledge of what people buy across a huge array of consumer categories. It has created a reputation for success in the four key customer satisfaction areas of immediacy of delivery, personalization, consistency, and anticipation. In the last year, its Alexa technology has vaulted to the front of voice search, which will constitute 50% of all searches by 2020! While Amazon has helped its third-party retailers increase revenue by 3-10% with new functionality like enhanced brand pages. We expect that Amazon will join Google and Facebook as a US digital media leader with its AMG group and expanded Brand media offerings. What should marketers and Brands do to profitably grow on Amazon? Amazon has a dominant position with 55% of online shopping trips starting on the site and 44% of them end on it, too. Amazon continues to post ever-higher profits as its fly wheel of lower costs and 2 hour delivery convenience meet the Ecommerce needs of its 90 Million US prime customers. It is the fifth largest digital company in the world but also the most personalized. Relying on its unparalleled knowledge of what people buy, Amazon’s skill with personalization has come to characterize its brand. Amazon’s creation of Alexa coupled with the rapid adoption of voice search means Brands will need to adapt their Amazon content strategy. Amazon SEO now requires a more careful keyword selection as it's A9 algorithm now considers a wider range of factors around conversion rate, relevancy, and customer satisfaction when ranking products. Now with the roll out of Enhanced Brand Content to all sellers there is an opportunity to engage customers through improved images, video, and brand stories. Amazon's goal is to stimulate quick buying decisions by allowing sellers to make their merchandise more visually attractive through showcased product placement and by answering common questions. We typically see enhanced pages increase product sales 3%-10%. Amazon is now a lot more than a marketplace and some prime TV reruns. It is a fully developed media channel that needs to be manages with the same consideration and efforts as you would Google or Facebook. In January of 2018, Amazon posted $1.9 billion in quarterly profits, its highest earnings ever [source]. This news came on the heels of the October 2017 declaration that Amazon’s founder and CEO Jeff Bezos overtook Bill Gates as the world’s wealthiest man [source]. Amazon’s #5 ranking in global digital investment (excluding China) in 2017 [source] coupled with its control of more than half of all online sales growth [source] means the internet retail giant now dominates the fates of many online brands. Brands and ecommerce startups may feel like under equipped Davids armed with slings facing down Goliath. 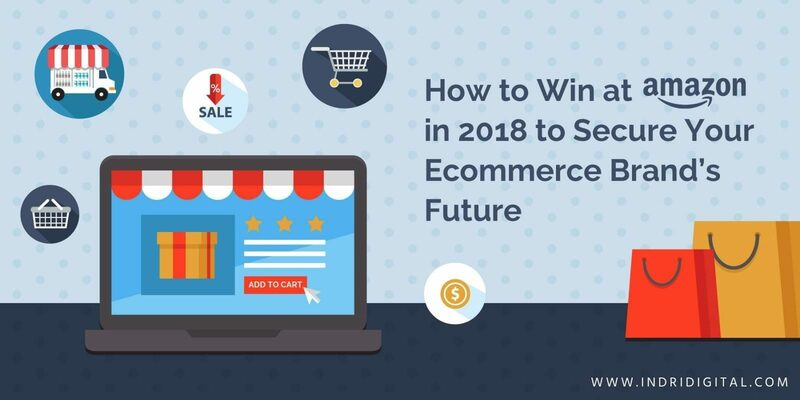 But learning the tactics to tame the Amazon giant is key to your ecommerce success not only in 2018 but for years to come. Customer surveys, social media segmentation, and customer profiles can give brands a sense of who their clients are and what they want. Amazon’s deep knowledge database, however, goes beyond what customers think they want and shows how those same consumers actually behave when spending their dollars and cents. For two decades, Amazon has amassed data on its customers, their preferences, and their buying habits. By employing increasingly sophisticated algorithms, the company can place targeted ads in front of those customers. Amazon knows what people buy, who their family and friends are, what they buy for them, and what they wish they could buy for themselves. It also has the power to put that information together into meaningful, actionable strategies. Over time, Amazon has become as much a media company as Facebook or Google is but equipped with more purchase based data. What does Amazon know about your online buyers? Everything that is possible to know about their purchasing habits. They even know those buyers’ new bank card details before the customers themselves do. Amazon is no longer just a stop-and-shop site. It’s a media behemoth. It has more valuable information at its fingertips than perhaps any other company in history. And it possesses the capacity to use that information in ways that lock consumers into a journey from the rim of the funnel to the bottom in one continuous stream of buyers. How do users expect Amazon to engage with them? Amazon is winning at all four. Immediacy: Salesforce says 64% of consumers and 80% of business buyers expect real-time interaction [source]. These numbers are trending upward as Millennials - a generation famous for its miniscule attention span [source] - become the dominant buyers in the market [source]. Amazon is the original on-demand experience provider. So much so, in fact, that it’s brand has come to stand for an immediate, satisfying customer experience [source]. Personalization: Thanks to Amazon’s unmatched database of customer information, its entire buying experience has a tailor-made touch. The company observes consumer behavior both online and offline. Amazon makes content available before the consumer asks for it. Its recommendations are personal. And its content is carefully worded to match each tiny segment of customers. While your brand may not yet have access to machine learning capacity the size of Amazon’s, you can segment your email list, produce focused content early, and anticipate what your customer will want to know, do, or buy. Consistency: 75% of consumers expect consistency across all channels, and 73% say they will transfer their business to another seller if they don’t get it [source]. At its heart, consistency is about customer loyalty, which Amazon has earned and solidified through Amazon Prime. In 2017, the company shipped more than five billion products to Amazon Prime members in 240 countries and territories [source]. People choose Prime for its fast and easy shipping, access to on demand media, and assortment of discounts drawn from across Amazon’s multiple endeavors [source]. Anticipation: Nearly 75% of customers expect businesses to anticipate their needs [source]. And Amazon has mastered the art of knowing what its customers want to buy before they do [source]. While Amazon can make excellent deductions from its mountains of data, a small or mid-size e-commerce brand can also use similar data it has in an intelligent and anticipatory way to please and delight customers. These four core pillars of customer engagement won’t change at Amazon as they tend focus years or decades into the future. But the technology that customers expect to interact with your brand has already shifted. Voice search is changing the ecommerce technology game. Futurists project that by the year 2020, half of all searches will be done by voice, and 30% will happen without a screen. Fully 21.4 million smart speakers will sit in American homes, and voice recognition will have morphed into a $601 million industry [source]. Amazon introduced Alexa as an attack on Google and in response to the anticipated growth of voice search. [source] In doing so, it doubled-down on all four elements of consumer expectation. Voice search is personal, anticipatory, consistent, and immediate. After all, what brand sits top-of-mind when people think of robotic personal assistants? Not Siri. Not Bixby. Not Cortana. But Alexa. Amazon’s Alexa device has earned comic portrayals on Saturday Night Live [source] and It’s a Southern Thing [source]. Entertainers aren’t giving that kind of space to other computerized assistants or to search boxes. Alexa has captured the public’s imagination - and increasingly it’s business. How are you positioning your products for people who are using a Voice query? According to the research, 62% of companies aren’t changing anything in anticipation of voice dominated searches [source]. That is an opportunity for your brand to better connect with customers as voice search explodes. With voice searches increasing, content creation, ad delivery, and product positioning also have to change. Voice search is longer, more linguistically natural, and often includes a more local geographic bent. SEO is changing and most dramatically at Amazon. Optimizing for keyword search terms on Amazon is different from optimizing for Google. Why? Google is a search engine. It’s where people start to look for information. Amazon is a buying platform. It addresses the needs and interests of purchase-ready shoppers at the bottom of the sales funnel. At Amazon, SEO begins in the title. Here’s the place to talk about brand, product line and type, a key feature, color, size, and quantity. To optimize for voice search, writers also add a long tail to the title. A search engine tool like Ahrefs or Moz can help marketers choose the right general keywords. Marketers test these keywords by checking out competitor listings before making their final selections. The most relevant buying keywords go first in the title. After the title, bullets claim the top SEO spot. Here’s where a product’s features and solutions go. A feature describes some fact about the product. A solution describes its outcome on the consumer. Using similar keywords in the bullets as in the title reinforces the product’s SEO appeal. Product descriptions tell a story. While these don’t directly affect rank, they do impact visibility. In 2018, marketers are no longer stuffing these descriptions with keywords, but they are writing engaging copy that includes specific search strings but with a problem > solution narative. [source]. By keeping voice search in mind, brand marketers can use the changing nature of SEO and media to dramatically increase their Amazon sales rank. How is Amazon SEO different? Amazon’s product search algorithm is called A9, and it differently than Google’s. In order to maximize revenue per customer, Amazon pulls product results from their catalog and ranks them according to conversion rate, price, relevance, and customer satisfaction. The algorithm considers several factors, including sales rank, customer reviews, negative feedback, product description, title, and exit rate [source]. Amazon introduced Enhanced Brand Content (EBC) in late 2016 to give its sellers a richer opportunity to engage customers through improved images, text placement, and brand stories. It was (and still is) available for free to members of Amazon’s Brand Registry. EBC’s goal is to stimulate quick buying decisions [source]. It allows sellers to make their merchandise more visually attractive through showcased product placement, and it gives them space to answer common questions. EBC is working. According to SupplyKick, “some products have shown a conversion rate increase of 30% or more in the weeks after Enhanced Brand Content is added.” [source] It’s a good to idea to monitor your own results. Keep track of sessions, buy box time, user reviews, conversions, and sales so you get a before-and-after picture of how EBC is working for you. You should see a lift and if you don't go back and test another variation! What are the best practices around Enhanced Brand Content? Amazon only opens EBC to Brand Registered sellers. Becoming brand registered is simple and free. Brands must hold a government registered trademark, and their products must not fit into any of the following categories: books, media, video, DVD, BMVD, and entertainment and sports collectibles. Registering a brand is always a good idea because it helps limit the sale of counterfeit goods, gives you better control over the buy box, and lets you have more oversight of your listing content [source]. Once registered, you can create an Enhanced Brand Content page using one of Amazon’s templates. The two key components of a successful page are appealing imagery and professionally written copy with keyword enhancements [source]. Photos should be high quality, nothing grainy or pixelated, and communicate the emotional feel of the product [source]. Copy is nearly as important as imagery. Studies show an estimated 59% of people always read the product description before buying and another 37% sometimes do [source]. Engaging copy focuses on the buyer not the product. It avoids lists of superlatives and cliches while using sensory words and offering social proof [source]. By keeping up to date on Amazon’s rules for EBC creation, and you should see your sales increase by 3-10 percent [source]. Amazon is now a media channel to be programmed and dealt with the same as Google or Facebook. We believe that Amazon will continue to increase advertising both on and off its website. Its bulked up its advertising staff and experimented with a variety of products. The company looks at advertising as a way to enhance its video products and ecommerce search. As we have seen at the 2018 SuperBowl it is also expanding its advertise on television and YouTube. In 2017, global digital marketing was a $209 billion business and will probably grow by 13% this year. Amazon ranked number five on the list of largest digital marketers [source]. It remains well behind Facebook and Google, but if history teaches us anything about Amazon’s pattern, it will climb and do so more quickly than many expect. Amazon’s depth of consumer insight coupled with advertisers’ desire to break the Google-Facebook stranglehold on digital marketing may catapult the e-retail company into a major digital advertiser this year [source]. "If brands aren’t thinking about Amazon as a media platform, they run the risk of becoming obsolete," Joe Migliozzi, Shop+ lead at Mindshare, said. "Understanding where and how to spend media dollars on Amazon is important, and integrating that spend into the rest of your media strategy is where brand loyalty and greater demand are achieved [source]." The Key to a Winning Amazon Ad Strategy? Go Big Everywhere Else by Brian Sheehan, Adweek, Feb. 2018. Amazon is about join Google and Facebook to form a block of three major entities that control online marketing. The e-retail giant has developed the architecture that will allow it to reach customers from the top of the funnel to the bottom. What’s your strategy for working with that new reality? 7 Customer Engagement Strategies That Marketers Can’t Ignore by Audrey Ference, Outbrain, May 2017. What is customer engagement? How does that look in an era of accessible and easy-to-use technology. This article is not about Amazon, but its recommendations apply to an Amazon strategy. How Your Customers' Expectations Have Changed in the Age of the Customer by Nick Johnson, Salesforce Blog, July 2017. Customers have high expectations for every interaction they have with a brand. They’re more than willing to take their business elsewhere when those expectations are not met. What do customers expect from you? How can you apply those expectations to your Amazon strategy? Pros and Cons of Amazon Prime Consumer Reports, Jan 2018. The Definitive Guide To Selling On Amazon by Big Commerce. A 165-page document that looks at every component of Amazon plus how to build a Strategy. It includes numerous case studies. To download the article, visit Big Commerce and give them your email address. 5 Reasons Amazon’s Enhanced Brand Content Could Improve Sales by MarketHustl.com, Sep 2017. This article offers a guide to EBC from what it is to how to do it.